ARTICLE Atomy Oceania’s Grand Opening: Opening a new era of Direct Selling in Australia. 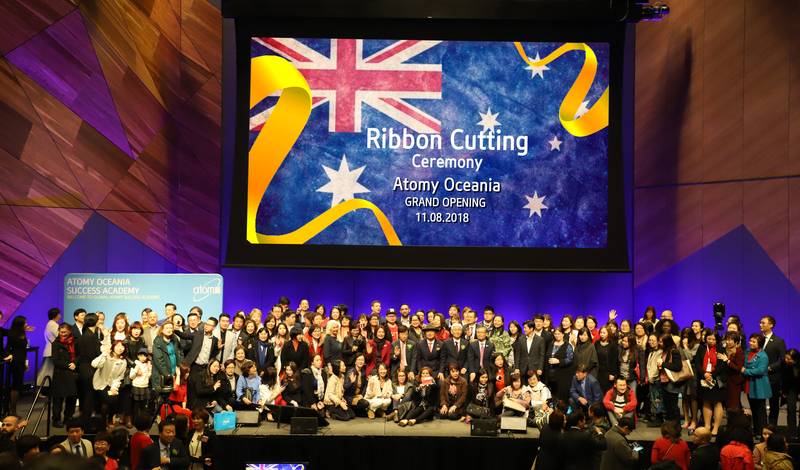 On the 11th of August 2018, Atomy celebrated its official launch of Atomy Oceania at the Melbourne Convention Exhibition Centre (MCEC) marking its beginning in the southern hemisphere. Mr. Park Han Gill, the founder and president of Atomy Global and Sally Kim, directing manager of Atomy Oceania, welcomed the opening of Atomy Oceania with congratulatory speeches. Gillian Stapleton, executive director of DSA Australia, was a special presence at the opening ceremony. Many members of Atomy Royal Leaders’ Club members were also present, expressing their gratitude and promising support for the growing market in Australia and New Zealand. Other 600 participants from in and outside of the country celebrated the opening. Culture of Observing Principles – Success is more rewarding when achieved through a fair process of abiding by the rules. Culture of Growing Together – Atomy will grow together with the community it belongs to. Culture of Sharing – Atomy will share love with all constituents of the society by giving back to them what it makes through Atomy business. While adhering to these 3 cultures of Atomy, Atomy Oceania will do their best to help all members to become successful business owners by providing them accurate information through diverse seminars and on/off-line marketing materials.